Do you get part way through your trainings or games and start to get sore/tight for no apparent reason? It may not be that something is damaged, it may be you need to build up the strength of a particular muscle group! Our muscles help us to move, dodge and burst into activity, but with repetitive use through games or training, these muscles can start to fatigue and not work as well as we would like. When these muscles start to get tired, our joints aren’t as protected as they were at the start of our activity, and they can start to work in different, less ideal ways, putting stress on different structures and often cause that annoying pain that creeps in half way through our activity. The key to getting through these niggles while we play is STRENGTH! Often we think we are getting “tight” and that we need to stretch out the soreness, when in fact it is the opposite, we need those fatiguing muscles to tone up and work harder, like they were at the start of our training or game. One of, if not the most, important muscle in keeping our lower limbs functioning in the right way and keeping our alignment correct is our glutes (buttock muscles). When these muscles start to tire our hips can start to roll in, our knees roll in and the arches of our feet start to flatten. This can lead to a number of aches and pains in the limbs, especially knee and hip soreness. They also work in tandem with our hamstrings, which are a commonly injured muscle group, especially in footballers (could this be related to common glute weakness??)! The other muscle that works extremely hard when we are running and playing sport is our calf muscles, the ones connecting our knee to our ankle that propel us forward and spring us into the air. These muscles can often feel tight during sport, and while this can be because of genuine “tightness”, it can also be because of weakness, and the more fatigued they get, the tighter they become. This leads to calf and ankle soreness, “shin splints” and general tightness in the lower limbs. Your physio can quickly and easily assess the strength and endurance of your muscles and see if they are a contributing factor to your pain, or, if they are in fact the key reason you are experiencing soreness. As a general rule we want the strength on our left side to match that of our right side, and there are certain limits we should be able to reach before fatigue, as a test to see if we are strong enough in certain areas. For “good” calf strength, you should be able to raise up on to your toes on one foot 20+ times without pain or discomfort, and should be able to do this on both sides. 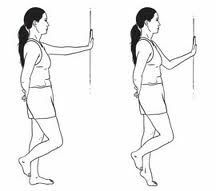 or discomfort, and again should be able to do this evenly on both the left and right sides. *If any of these exercises cause pain or discomfort, cease immediately and contact your physio!